With a population over 80 Million and one of strongest economies worldwide, Germany is a lucrative market for many Amazon sellers. But apart from the promising market opportunities, there are also many barriers to great sales success. Germany is not only known for its wealth, but also for its laws and regulations. Bureaucracy is as deeply anchored in Germany as the love for beer and hearty food. So it comes as no surprise that yet another law will come into force in 2019. The new German packaging law, which regulates the disposal responsibilities of product packaging, strengthens environmental protection, but causes great concern to sellers who are active in the German market. But don’t worry: we’ll give you the most important facts about the new German packaging law. What is the New German Law about? On January 1st, the Packaging Act (German: VerpackG) replaces the Packaging Ordinance that entered into force in 1991. Both laws specify the product recycling responsibility for packaging materials. The idea behind is that packaging sellers must ensure in advance that the packaging they put into circulation is correctly disposed of, whether used for product protection, marketing purposes or shipment packaging. Simply said: Manufacturers need to pay a yearly recycling fee depending on the packaging amounts they sell to the German end-consumer market. 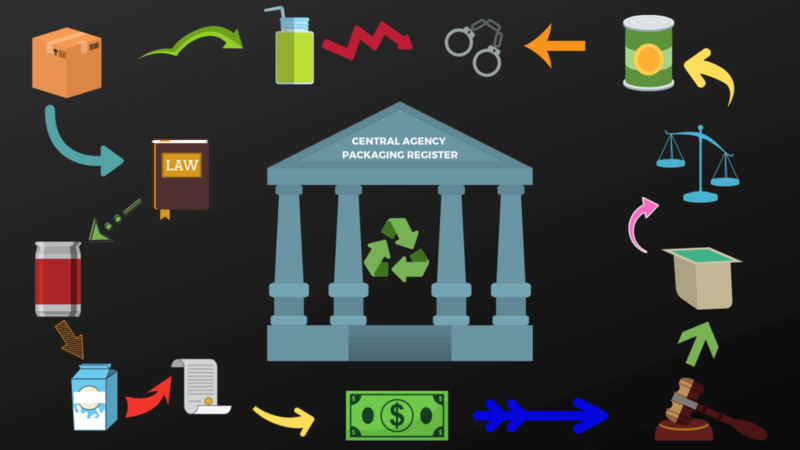 What is changing and why is a new Packaging Law needed? From January 1st, every company will be obliged to register at the Central Agency. Every registered company will receive a registration number. What exactly are the Central Agency and LUCID? The agency acts as federal authority. It has been entrusted with sovereign tasks which are specified in §26 of the Packaging Act. The Central Agency is responsible for the registration of manufacturers as well as the reception and verification of data reports from manufacturers and systems. To sum it up: it is responsible for monitoring compliance and system participation by the manufacturers. At the same time, the Central Agency informs all those with legal obligations of these obligations and ensure that that they can fulfil them with as little administrative burden as possible. For this purpose, the Central Agency has set up the packaging register “LUCID”, which name stands for transparency. LUCID is a public register and makes it possible for everyone to see which manufacturer is registered for which trademarks/brands. With the registration, however, the manufacturer confirms that he has correctly fulfilled his product responsibility. If a manufacturer has not registered correctly, the packaging materials with these brands will be subject to a distribution ban, meaning that they may not be marketed at any trade level in Germany. So be careful: Since the register is open and accessible by anyone, it is easy for the authorities and your competitors to check if you comply with the law. And if you don’t, it is likely that your competitors will report you to the authorities in order to hurt your business. What are the Consequences of Non-Compliance with the New German Packaging Law? Your existing products will be banned from the German market by law, meaning that they are no longer allowed to be sold – neither by you, nor by any other distributor. In the event of non-registration or distribution of goods for which the manufacturer has not properly registered the brands it markets, a fine of up to €100,000 per case may be imposed. Not participating in the system may be punished with a fine of up to € 200,000. It is conceivable that competitors will enforce the distribution ban by civil law. It doesn’t matter where your company is based – if you want to sell to the German market, you need to go through registration and licensing! Which Sellers and what Types of Packaging are affected? Only if the products you sell to Germany have already been licensed in Germany before, you are not obliged to license these materials. If they haven’t been licensed before, you should get them licensed in order to avoid a distribution ban and big fines. If you ship your products to the FBA warehouse, you don’t need to license the transport packaging and filling materials, as these will not end up at the end-consumer. Only Packaging that ends up at the end-consumer has to be licensed. The packaging that Amazon uses to ship your products are already licensed by Amazon. To avoid getting banned from the market or facing tremendous fees, you should register before the end of 2018. You can simply register your brands on lucid.verpackungsregister.org. If you have no own brand, adding your company name is sufficient. Before the end of 2019, you need to license your packaging materials using a system partner like zmart24.de. When licensing to your system partner, you need to sign with your registration number provided by the Central Agency. After the submission at your system partner, you need to immediately report your data to your LUCID account. If you ship your products to a FBA warehouse, you don’t need to license the transport packaging and filling materials, as these will not end up at the end-consumer. Only packaging that ends up at the end-consumer has to be licensed. The packaging used by Amazon to ship your products are already licensed by Amazon. Before the end of 2018, you need to license your packaging materials using a system partner. To do so, you will need the registration number provided by the Central Agency. the last bullet is correct. The Packaging Act applies from 01.01.2019. From then on you must be registered with the Central Office and have licensed your packaging material. Otherwise you are not allowed to sell your goods in Germany. If you have any questions please write to me at [email protected]. We are a dual system in Germany and can tell you everything about the packaging law. Are you sure the email address [email protected] is available? many times emailed but no response. we are meeting some question when register the zmart24.de. Could you email back at [email protected] ? I’m very sorry your questions haven’t been answered yet. We have so many inquiries at the moment that are pushing our internal sales team to its limits. I will now personally take care of your concerns and answer you today. I only have one request from Jennifer so far. Can the others please send their request again? We haven’t received anything as yet ? beim Versandhändler. Der Logistikunternehmer ist nicht als Inverkehrbringer im verpackungsrechtlichen Sinn anzusehen und trägt daher nicht die Produktverantwortung. Das Logistikunternehmen wird nur als „verlängerte Werkbank“ oder „Lohnversender“ tätig, ihn treffen keine verpackungsrechtlichen Pflichten. gesamten Verpackungsmaterials) übermitteln lassen, damit er die Systembeteiligung bzw. insbesondere die Datenmeldung an die Zentrale Stelle durchführen kann. Es ist nicht zulässig, für die Datenmeldung Dritte, etwa den Logistikunternehmer, zu beauftragen. Der Umfang der Systembeteiligung richtet sich danach, ob der Versandhändler nur die Versandverpackung befüllen lässt oder auch das Produkt importieren lässt. die er pro Jahr in Verkehr bringt, anzugeben (Mengenmeldungen). → Angabe von Markennamen: Er muss die Markennamen zu seiner Versandverpackung angeben (den Namen seines Versandhandels) und, sofern er importiert, auch die Markennamen der Produkte). You still say that if you sell on Amazon.de (as a foreign company and importing products to Germany), you don’t need get a register and get a license? Hi Swantje, you need to register and license if you sell into Germany. Only exception is if the products were already imported and registered by another company before. For further assistance you might contact the licensing partner at [email protected] – thanks!